Clutter Blocks My Brain – Or Does It? No, this is not a blog about clutter (sort of). I’ve been reading a lot about clutter this month, however – when I’m not reading yummy romance novels, that is (Jamie Beck’s Worth the Wait – so good!). It *is* the first of the year, though – and resolutions are made (and broken) every New Year. Mine is all about getting my house under control. And I patted myself on the back. I was a tidy person! I could clean the house, top to bottom, in a single day (it was a really small house). I took care of my family that way. And I wrote while my daughter napped. It wasn’t hard at all! Where did that woman go? Who is this aging writer, with Too Much Stuff in her clutches and Too Many Stories in her brain? My children are grown, I have a big(ger) house, and it’s a mess. I recently read an article about how creative people thrive in disorder and I wonder: how? I’m a creative person and, whenever I sit down to write, I find myself contemplating the clutter around me. I mentally shame myself for not leaping to my feet and cleaning it all up. Then, I tell myself, I could write in peace, loving the house I’m living in and having freedom to spin my glorious tales (which would immediately make every bestseller list known, and gain me a gazillion dollars). Where I write, before stuff crawled began to surround me… ! What do you think? Have you ever been stopped dead by clutter? Or do you thrive in it? Do you enjoy settling down to a pristine, tastefully decorated desk? Do you color code your file folders? Or are you a whirlwind of disorder, obsessed with spinning your tales and too darned bad if the junk doesn’t get picked up – you have stories to write! Maybe it’s a fantasy I have, that my house will be perfect one day. Maybe I need to write a story about the house that could be perfect. Wait – I already have that story in progress! 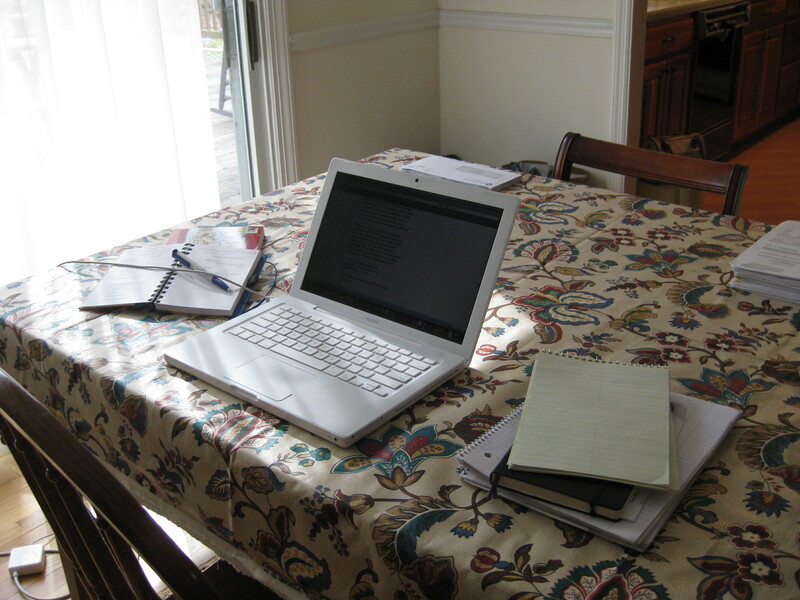 Where do *you* like to write the most, and what atmosphere makes you the most productive? Thank you for the kind reply, Lori! All the clutter and family and work and writing are part of the journey. If I keep it in perspective, the clutter will either be less interesting, or there will be less of it! I TRY to clean up, but I usually sweep that thought under the rug (quite literally) for something better to do. Like read or write. Good luck on decluttering, but don’t worry about it. It will somehow clutter itself all over again. So, WRITE YOUR BOOK AND FORGETTABOUTIT. Argh! Thanks, Kim – you are like my husband with your paper lasagna. He has numerous piles in the house, and seems to find what he needs every time. I am keeping with the writing, though – I’ve found that plugging in my earbuds is great for helping me zone out! Once I have some music to ground me, I can activate the imagination and make progress. Hi Susan! I knew there was a reason I loved you so. (There are many reasons, for the record.) But yes, I agree it’s hard to write when you have a “to-do” list lingering in the back of your mind. I’m glad you wrote this post today. I’ve been thinking a lot lately about the “mind game” it sometimes is to be a writer and how you have to be in the right space in your head in order for the words to flow. I guess my advice would be to accept that you’re never gonna get everything in perfect order. Know that you’re not alone in this fiction affliction. And lastly, as long as there’s room inside that gorgeous brain of yours for you, your characters, and what they happen to be up to at the very moment in time that you decide to sit down and listen to them, you’re all good. Carlene, how do I answer such a perfect reply? You are right on so many levels! Thank you, dear heart, I feel better already.